Derek Bermel has been hailed by colleagues, critics, and audiences across the globe for his creativity and theatricality as a composer of chamber, symphonic, dance, theater, and pop works, and his versatility and virtuosity as a clarinetist, conductor, and jazz and rock musician. Bermel's clarinet playing has been hailed by the New York Times as "brilliant" and "first rate". He premiered his own critically acclaimed clarinet concerto, Voices, with the American Composers Orchestra in Carnegie Hall, and revisited it with more than a dozen orchestras, including with the BBC Symphony, Los Angeles Philharmonic, and at the Beijing Modern Music Festival. In 2010 he was nominated for a 2010 Grammy as Best Soloist with Orchestra for his performance of Voices on BMOP/Sound. "Composer and clarinetist Derek Bermel recalls the much earlier model of virtuosos such as Rachmaninoff and Kreisler." Other recent appearances include John Adams' concerto Gnarly Buttons with the Los Angeles Philharmonic (the composer conducting), Fang Man's concerto Resurrection, and the Copland concerto with ACO, Bolcom's Concerto with the Lexington (KY) Philharmonic and the Greensboro (NC) Symphony, and André Hajdu's klezmer concerto Jewish Rhapsody with the Westchester Philharmonic (NY). Bermel has performed his music on four continents and premiered dozens of new works for clarinet in appearances as soloist throughout the world. His first album Soul Garden, a disc of his chamber music on New World Records, was released to wide acclaim. 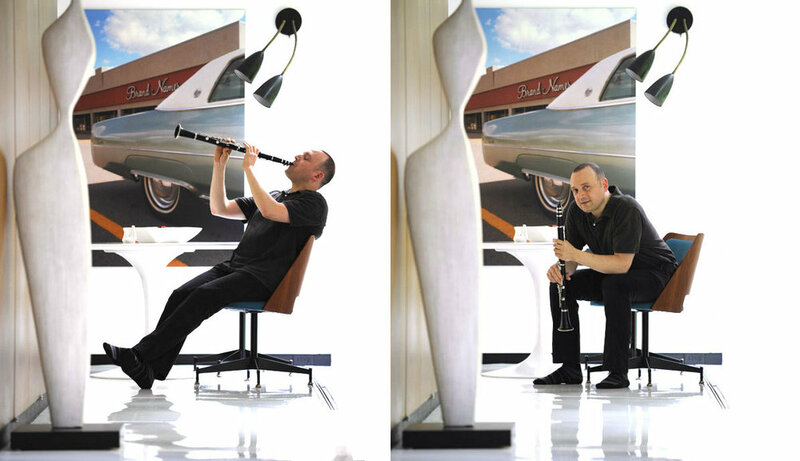 Bermel also performs regularly as founding clarinetist of Music from Copland House. As a composer, Bermel has received many of today's most important awards, including the Alpert Award in the Arts, the Rome Prize, Guggenheim and Fulbright Fellowships, the Trailblazer Award from the American Music Center, the Academy Award from the American Academy of Arts and Letters, and residencies at the Lincoln Center Directors Lab, Tanglewood, Aspen, Bowdoin, Banff, Yaddo, Sacatar, Bellagio, Copland House, and Civitella Ranieri. His music is published by Peermusic Classical (US) and Faber Music (UK). "There doesn't seem to be anything Bermel cant do with the clarinet"
Bermel's hands-on experience with music of cultures around the world is woven into his language as a composer and performer. He studied ethnomusicology and orchestration in Jerusalem, and later traveled to Bulgaria to study the Thracian folk style, Dublin to study uillean pipes, and Ghana to study the Lobi xylophone. Well-versed in the classical and jazz repertoire on both clarinet and piano, Bermel trained with Ben Armato of the Metropolitan Opera and later at Yale University with Keith Wilson and the University of Michigan with Fred Ormand. He studied composition with William Albright, Louis Andriessen, William Bolcom, Henri Dutilleux, and Michael Tenzer. Recent commissions include those by the Pittsburgh, National, Boston, St. Louis, New Jersey, Albany, and Pacific Symphonies, Los Angeles and Westchester Philharmonics, Los Angeles Chamber Orchestra, Chamber Music Society of Lincoln Center, WNYC Radio, eighth blackbird, Music from China, violinist Midori, the Guarneri and JACK string quartets, electric guitarist Wiek Hijmans, cellist Fred Sherry and pianist Christopher Taylor, as well as Koussevitzky and Fromm Foundation commissions. He has led master classes and held residencies throughout the U.S. and abroad at schools including Yale University, University of Michigan, Longy School of Music, Peabody, Columbia University, Juilliard School, Mannes (New School), Manhattan School of Music, RISDI, Rotterdam Conservatorium (Netherlands), University of Western Michigan, University of Chicago, Universita Federal da Bahia (Brazil), University of Texas (Austin), University of Cardiff (Wales), UCLA, University of North Carolina, University of Southern California, Curtis Institute, Eastern Carolina University, Northwestern University, Aspen School of Music, Bowdoin International Music Festival, Duquesne University, Central Michigan University, and the Tanglewood Music Center.